The main dining room and bar seats 75 in a room surrounded by double-height windows. The chunky bar stools are custom made by +Tongtong. Hotelier Jeff Stober’s rustic getaway on Lake Ontario invites guests into a playful mash-up of art and vintage. Outside the Drake Devonshire in Prince Edward County, one of Ontario’s most picturesque agricultural regions, an upright player piano sits halfway between the parking lot and the front entrance, its strings sutured to amplifiers and extended to reach the inn’s parapet. As guests arrive, the exposed strings vibrate in the wind and Chopin fills the air. The gentle greeting, conceived by sound artist Gordon Monahan, sets the tone for this new type of getaway: the country inn as an art-filled, hipster-friendly retreat. The lodgings are built around the historical Wellington Iron foundry, which dates back to 1860, now with a new campus of barn-like additions surrounding it on all sides. 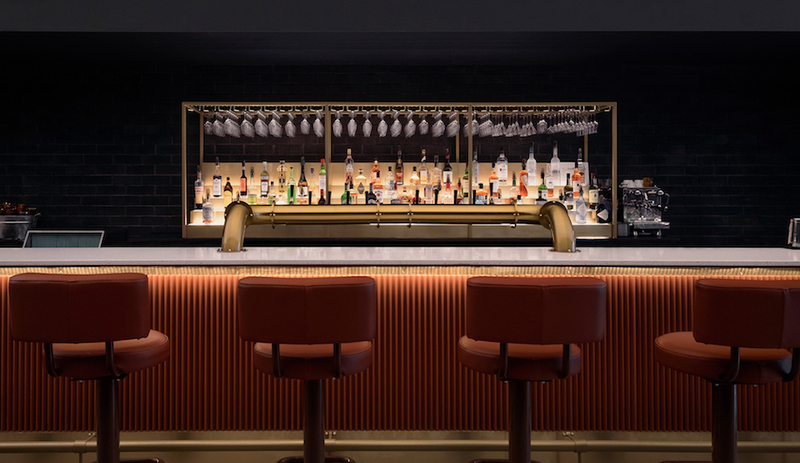 Together, the cluster of buildings amounts to a 1,200-square-metre interior with 11 guest rooms, two suites and a dining room and bar that seat 75. Various other anterooms offer Ping-Pong, canasta or karaoke until dawn, and a covered patio functions as an event space and an extension of the dining room. Left: Art is showcased throughout, including this paper installation by Kirsten Hassenfeld. Right: Designer John Tong mixed styles and genres at every turn. His sculptural custom coat racks lean against a chalkboard map of the area. 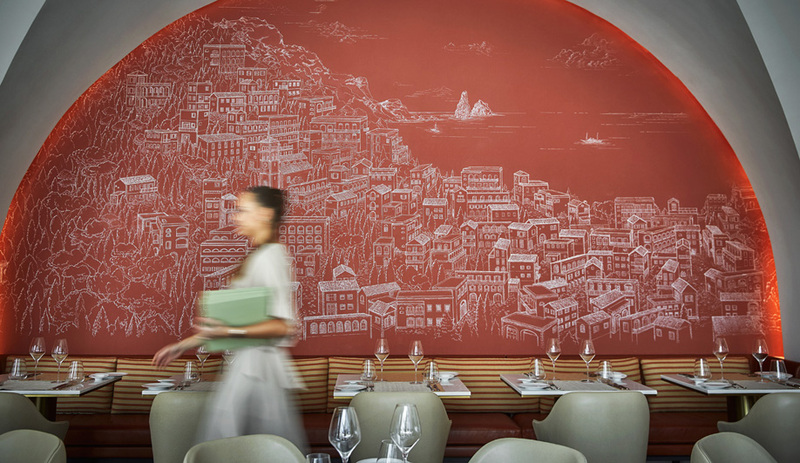 The quirky vibe and the liberal use of bold colours, patterns and textures – along with an idiosyncratic approach to history, where old and new are tossed together like a giant salad – is a collaboration between John Tong, a designer and co-founding principal of +Tongtong, and Drake Devonshire owner Jeff Stober. The two have worked together before on various projects, though they are best known for turning a rundown Toronto establishment into the Drake Hotel. When it opened on Queen Street West in 2004, it caused a cultural quake, becoming the first place to mix out-of-town guests with local creative types. Art, music, film and endless late-night theatrical weirdness play into the Drake’s ongoing appeal, and its multifaceted interior popularized a wave of designers who made upcycling, irony and humour-filled campiness their stock-in-trade, an aesthetic that has now become ubiquitous. Distressed plank flooring and white-painted brick walls define the main corridor and the kitchen pickup area. Art by Jennifer Murphy; blue and white cement tiles by Sabine Hill. However, the Devonshire, a two-hour drive east of Toronto, is not a sequel; it is its own thing. It repeats some details from the Drake (there is, again, a photo booth in the lobby and an array of vintage furniture). Otherwise, the Drake Devonshire fits comfortably into its rural context, overlooking Lake Ontario and surrounded by dairy farms, wineries and canneries. Although the County can claim the world’s largest bay mouth dune beach, Sandbanks Provincial Park, the area has never fully caught on to its potential as a destination. The original foundry is surrounded by barn-like additions and an extended porch that overlooks the beachfront. 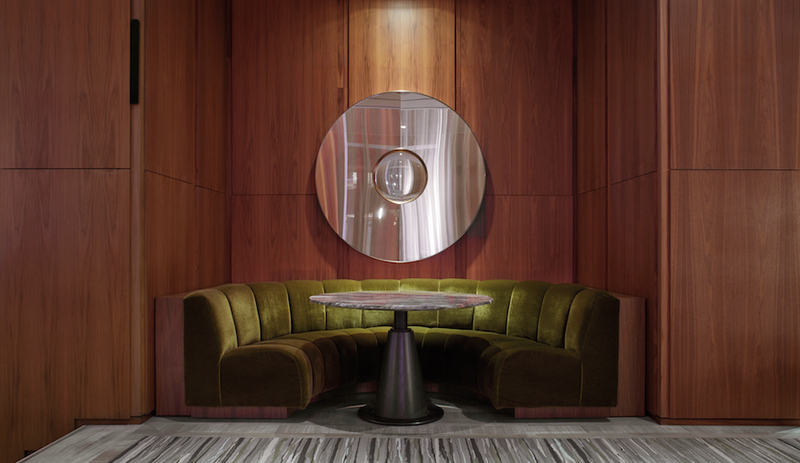 While the Drake is all about thrumming urban energy, the Devonshire revels in relaxed quietude. “It reminded me of the Eastern Townships in Quebec, where I used to spend summers growing up,” explains Stober, who searched the locale for several years to find a suitable property. Tong worked with him for another two years to renovate and rejuvenate the foundry, bringing in historical conservationists ERA Architects to rescue it from decay. Many original architectural features remain, including the entry and its ornately carved maple staircase, and the wood-burning brick fireplace that stands as a focal point in the parlor. The refurbishments are replete with witty winks and all-around mischievousness. “Architects often set conceptual rules for themselves,” says Tong, “which can be constraining. We set rules for ourselves, too, but we also tried to break as many of them as possible.” His Les Ailes Noires coat racks, a signature design, appear here, jutting out into the main hallway and creating an optical illusion. At certain angles, they appear as flattened boxes drawn over a map of the County on the chalkboard wall behind them. Left: The owner’s suite on the second floor overlooks the lake. Vintage and modern furnishings, sourced from antique shows and flea markets across North America, lend character to the space. Right: Each room comes outfitted with virgin wool throws, marble counters in the bathrooms and a “curated” gift tray. To furnish the inn, Tong worked with Drake’s in-house stylist, Carlo Colacci, scouring antique shows and flea markets across North America, including the Brimfield Flea Markets near Boston. Mia Nielsen, the Drake’s art curator, commissioned and collected works that reflect the rustic theme. One of the central beams in the dining room, for instance, has been crochet bombed by London Kaye of New York, so it resembles a fishing net – a nod, perhaps, to the area’s former fisheries, and appropriate given the local menu offerings by chef Matthew DeMille, among them Lake Ontario pickerel. A series of flea-market paintings re­interpreted by Team Macho hangs in one of the guest rooms. Jane Boyd makes the rag dolls for sale. Elsewhere, more twists on tradition emerge. The games room, adorned with a comic-inspired mural by Faile of Brooklyn, has a pitched ceiling and exposed Douglas fir rafters. It looks just like a barn. In the dining room, custom banquettes upholstered in buttery leather are matched with school light pendants above each table. The historical brick fireplace provides a focal point in the parlor. Floor tiles by Donna Fugata, for 14OraItaliana of Italy. Some of the most striking hybrid moments are found on the walls. For one collaborative project, Nielsen bought more than 30 paintings un­covered at yard sales, the kind featuring idyllic but bland rural scenes, then commissioned Toronto art collective Team Macho to reinterpret them by adding humorous bits of pop culture. In one, Sailor Moon and Gumby go for a stroll. 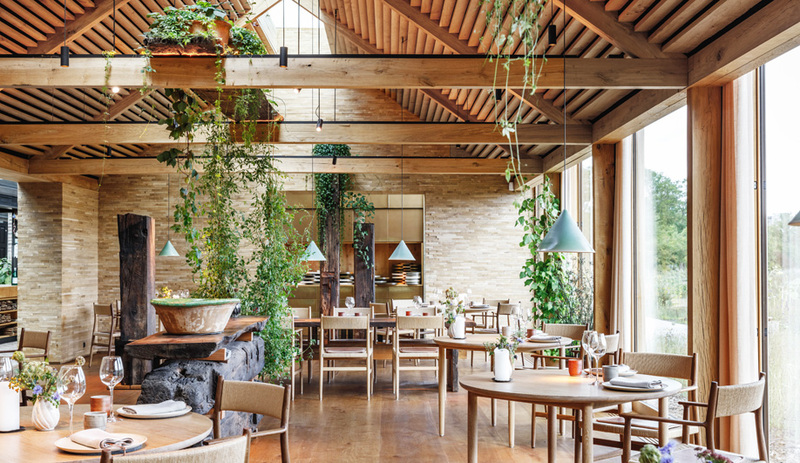 The scene is not unlike the Drake Devonshire itself: an upended, reinvented environment that commingles poetic­ally with its bucolic surroundings. How to get there The small town of Wellington in Prince Edward County is a two-hour drive east from Toronto along Lake Ontario, with a turn south at Belleville. Major high-ways give way to rural roads that wind through farmers’ fields, some populated by wind turbines. What to see Natural beauty abounds, with impressive national parks, including Sandbanks Provincial Park, the world’s lar­gest formation of bay mouth barrier dunes and a geological legacy of the last ice age. The County is also a bird migration hot spot. At one quirky attraction, Birdhouse City (County Road 8, near Picton), volunteers maintain more than 100 folksy birdhouses. Where to eat One of the region’s best wineries is Norman Hardie Winery and Vineyard, located at 1152 Greer Road, Wellington. Former Four Seasons sommelier Hardie travelled the world studying viticulture and winemaking to craft his Pinot Noir. Fifth Town Artisan Cheese Co. churns out organic goat and sheep milk curds at a nearby facility powered by wind, solar, and geothermal energy. For local cuisine, try the Hubb at Angéline’s Inn, which serves up such daring choices as duck hearts with vanilla bean and apple butter ( ­433 Main Street, Bloomfield). Where to shop At the Drake General store in the lobby one finds stemware and platters by Toiletpaper for Seletti, and the Drake’s own line of bath and body products. In Bloomfield, Kokito carries such folksy Canadian items as felt slippers by Fugitive Glue and new home accessories by Umbra Shift (285 Main Street, Bloomfield).